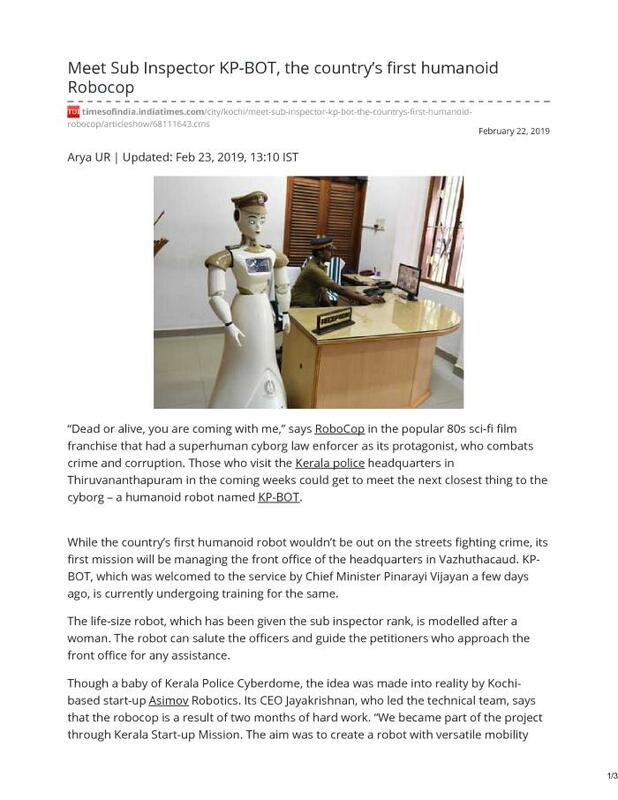 Though a baby of Kerala Police Cyberdome, the idea was made into reality by Kochi-based start-up Asimov Robotics. Its CEO Jayakrishnan, who led the technical team, says that the robocop is a result of two months of hard work. “We became part of the project through Kerala Start-up Mission. The aim was to create a robot with versatile mobility and that can interact autonomously. The KP-BOT is designed to greet, guide and interact. As part of its launch, we had only given it basic training on greeting high-ranking police officials such as the DGP with a salute and self-introduction,” he says. However, he explains that the sub inspector will also be trained by feeding databases on case files, identity information, face-and-voice detection of public, and responding to these. “In the next phase, we will be training KP-BOT to recognise and respond to Malayalam speech. There would be various kinds of petitioners, and so she would be trained in understanding their emotional state of mind and also in booking those who attempt to bribe her,” Jayakrishnan says.